In the backyard there is a ground level wood deck in addition to the several balconies/decks accessed from inside the house. FAIRFIELD — Most of Connecticut’s municipalities have a nickname. Danbury is the Hat City. New Haven is known as the Elm City. Stamford is the Lock City. Hamden is called the Land of the Sleeping Giant. Fairfield could have any number of nicknames — the Dogwood Town being one of them. Although, perhaps it could have been given Bridgeport’s moniker: The Park City. Fairfield has many parks, open spaces, and Aspetuck Land Trust preserved acreage. The taupe-colored contemporary house at 84 Hitching Post Lane in the university neighborhood is within easy access of more than a half dozen of them, including Springer Glen Open Space, Mount Laurel Park Open Space, the Aspetuck Land Trust’s Harwood Preserve and Butkus Pond Preserve, Samp Mortar Rock, Riverside Park, and Trillium Road Open Space. Each place offers its own opportunity for recreational pursuits, among them hiking and fishing. According to the Fairfield town website, there are three entrances into Springer Glen Open Space, including at the south end of Pheasant Lane right around the corner from this house. There is plenty to enjoy right on this property as well. It contains almost a half an acre of land with a wood deck and multiple raised decks or balconies, relaxing places to sit and outdoors surrounded by a privacy scrim of trees. There is ample amount of lawn for child’s play, croquet, horseshoes or bocce, and the paved driveway provides a large “canvas” for chalk art, skipping rope, and basketball pick-up games. 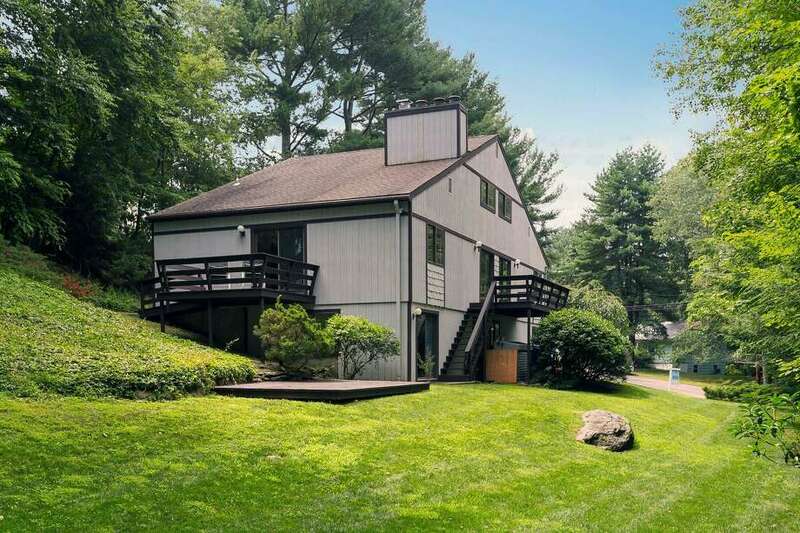 It’s a very “private and peaceful” property even though it is convenient to local amenities including the public library branch on Fairfield Woods Road, shops and restaurants on Black Rock Turnpike, and it’s not far from Osborn Hill School and playground. It’s an easy commute to downtown and the Metro North train station, and about equidistant to Interstate 95 and the Merritt Parkway. The house itself resembles a giant present just waiting to be opened. This present is “wrapped” in vertical board with visually appealing shingle detailing under the windows on the front facade. Inside, that present has 3,774 square feet of living space on three finished floors with at least four and possibly a fifth bedroom. The configuration of the ground level provides the possibility of creating an in-law suite, because it allows for living on one level with no stairs to navigate, or it could serve as an au pair suite. The house was built in 1974 and was well maintained. The hardwood floors were stripped and polished in recent years and just last year the three full bathrooms were painted, the driveway was sealed, and all the decks were stained. The water heater was replaced in 2015. Other improvements were also recently made. This level also contains three bedrooms. The master suite is in a private wing and two other bedrooms are on the opposite end of the house. They share a full bath. The master has a fireplace, walk-in closet, a private bath, and sliding doors to its own private deck/balcony. On the lower level, there is a sitting room with a stone fireplace and sliding doors to the yard and deck, a large laundry room/full bath, and two bedrooms, one of which currently is used as a home office. For more information or to set up an appointment to see the house, contact Bette Gigliotti of Gigliotti Group/William Raveis Real Estate at 203-451-0040 or GigliottiGroup@Raveis.com.